Moms, this challenge is for you! Give yourself this gift this year. Just 15 minutes minimum a day reading books that you are interested in reading. We provide the thread each week to share what you are learning with us! It is said, "What is down in the well, comes up in the bucket." Moms, what is down in your well? Will your family find invigorating and thirst quenching refreshment? Or will they find the well dry or stagnating? Readers are leaders! Mothers lead their children, so mothers are leaders. Where are you leading your children? Become a reader! With homeschooling, running a home, and some of you also are running a home business, where do you find the time to read? Just fifteen minutes a day can make a huge difference! Most of us can find fifteen minutes. In a week, a a mom can read one hour and forty-five minutes in just fifteen minutes a day. I am not a fast reader. So, for me this works out to be about six pages a day. This adds up. Read and ponder what you read. Share what you are learning with your family. Share on our Mentoring Our Own Facebook group what you have gleaned from the day's reading. If you cannot read the whole reading in fifteen minutes, don't worry. Read what you can and share what you learn. If you are not ready for the Harvard classics yet, no worries. Just choose to read something else and share one thing you learn. I suggest you do your Fifteen Minute Scholar readings after reading in God's Word each day. After you read each day, ponder and reflect on what you have read. Some time during the day, take a moment and write one thing you learned. Consider becoming a Fifteen Minute Scholar! 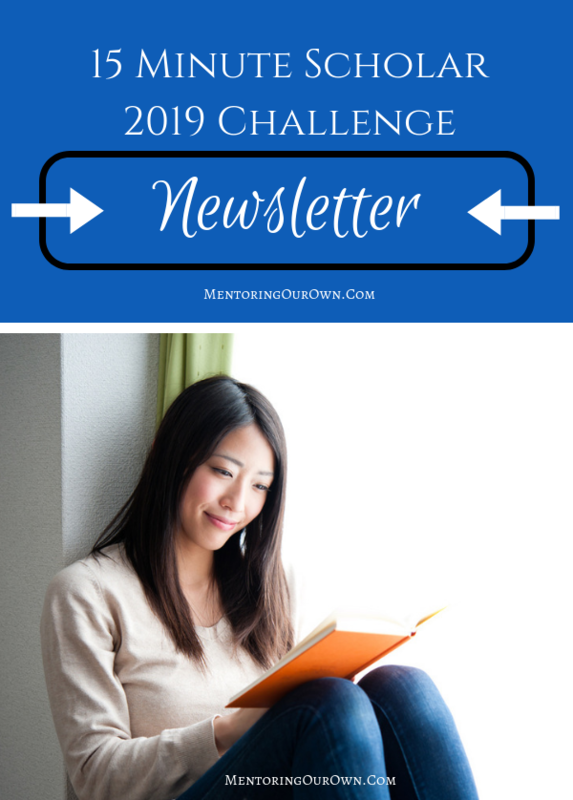 Join our Facebook group and take the "15 Minute Scholar 2019 Challenge﻿.﻿" Sharing your reading is just a click away! Moms, do it for you and for your family. This is doable. Join us!!!! Just click the orange link below, join our Facebook group and participate in the "15 Minute Scholar 2018 Reading Challenge!" You will be glad you did. There is no cost for you to join in January. Just start the readings for the day you join. If you have time to read the readings you missed, great, you will be blessed for it, if not, just move forward, you will still be blessed! 2019 is going to be an amazing year!!! Above is this week's Newsletter, if you prefer to recieve the Weekly Newsletter in your email please sign up below. Along with this newsletter you will find news of upcoming webinars and site news! This week's newsletter will be available via email through Monday, 7 January 2018, when the next Newsletter is scheduled to be released.